scars1 Forums - Has anyone tried Egyptian Magic Cream for acne scars? Has anyone tried Egyptian Magic Cream for acne scars? Topic Title: Has anyone tried Egyptian Magic Cream for acne scars? No I have not tried any such cream to treat my scar. I used surgical treatment for my face scar that disable now completely and not taking botox treatment for skin care. Sano Naturals Phytoceramides contains 100% of your daily Skin Vitamins A, C, D and E. You only take one skin care supplement. Our Phytoceramides are proudly produced in the USA in a GMP certified facility according to exacting standards of safety and quality. -Restore Structural Integrity of Your Skin -Promote Skin Hydration. Young skin is full of ceramides a lipid that keeps your skin hydrated and smooth. As we age, skin naturally loses ceramides over time. I suggest you have a look at products made from the Meriance. It contains ingredients to act as anti wrinkle and anti aging cream, at the same time stimulates skin regeneration and replenish daily moisture loss. http://www.meriance.com/en/collagen-cream is rich in Amino Acids and minerals, stimulating skin rejuvenation with the effect of a smooth, soft and healthy skin. Moisturize is particularly essential in case you have dry skin. Skin dryness can lead to patches and breaks in it along with causing peeling of the skin. For this, you should drink plenty of water on regular basis and can think of applying herbal based creams. Don't always get entice with the products that says it is magic or instant, it is only part of their marketing strategy. Always see if it is approved by experts or if someone had used it, check for testimonials. My thoughts? I have been using Egyptian Magic Cream and believe it does a fine job in addressing different types of skin problems. For instance, it helps prevent acne outbreaks, diminishes the appearance of scars, minimizes fine lines, moisurizes dry patches of skin, restores elasticity to crepey areas, and so much more. Is this cream the answer to all skin problems? I do not believe so. Even so, it is an effective remedy for certain skin issues. And, with continued use, it can make a difference. Andy, well I took the plunge and bought Egyptian Magic Skin Cream. It arrived one day last week, so I cannot say how magic this product will be long-term. Even so, my initial reaction is quite positive on a couple of different fronts. Number one, the scar above my left eyebrow (from when I smacked my head on the nightstand) does not seem as visible. Number two, the hyperpigmentation on my right cheek also seems improved. Is it my imagination? I really do not think so: I believe this product is making a difference. Dear Andy, thanks for all the great info. I did some research, and the reviews for this product were quite positive. 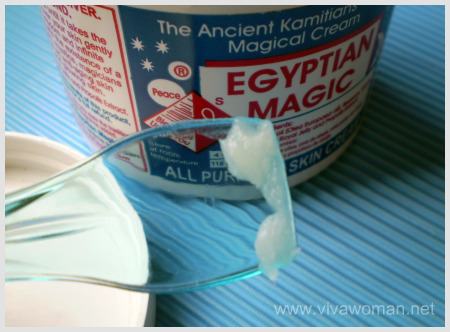 It seems Egyptian Magic Cream is great for improving red blotches, minimizing acne, evening out dark patches, reducing the appearance of facial scarring, and it is even beneficial for softening dry or cracked hands and feet. And the exciting part that really makes me want to rush out and buy it? It does not contain synthetics or chemicals. Gosh, I am eager to get some, I will let you know how it works on my skin. Andy, thanks for the useful information! I actually don't know much about Egyptian Magic. Is it something you're supposed to use daily forever, or just for a limited amount of time? How long have you been using it? Gosh, I am somewhat intrigued by the Egyptian Magic Cream. Did you continue using it on your acne scars? Did you get a different result? If you stopped using it after only one application, I would try it again; perhaps your skin needs to become accustomed to the consistency. I wonder if Egyptian Magic Cream might work on other types of facial scars? Anyway, thank you for the info. I actually think I might try it. Is Amazon the only place that sells this product? I have never tried Egyptian Magic Cream, but I think that it is not harmful to your skin and it will not make your skin worst. Egyptian Magic uses natural substances for its products, and truly, naturally-made products are much better than chemicaly-made products. Therefore, continue using it. Keep me updated on how your skin turns out. I've heard from some websites that the Egyptian Magic Cream can actually fade the acne scars. Has anyone ever used it before? I just bought one from Amazon and tested it for once yesterday. It's really thick and smells exactly like honey. Then I woke up this morning with a very oily face. The cream was not absorbed.I am actually a little bit afraid that the cream could worsen my skin condition... Should I stop using it? Anyone has any ideas please help me!